Located in Goslar Rural District, this hotel is 0.1 mi (0.1 km) from Gustav Adolf Stave Church and within 9 mi (15 km) of Goslarer Rathaus and Goslar Imperial Palace. Mines of Rammelsberg and Oker Dam are also within 12 mi (20 km). Located in Goslar Rural District, this property is 0.2 mi (0.3 km) from Gustav Adolf Stave Church and within 9 mi (15 km) of Goslarer Rathaus and Goslar Imperial Palace. Mines of Rammelsberg and Oker Dam are also within 12 mi (20 km). This family-friendly Goslar vacation home is located on the waterfront, 0.6 mi (0.9 km) from Gustav Adolf Stave Church, and within 12 mi (20 km) of Marktkirche St. Cosmas und Damian and Museum und Besucherbergwerk Rammelsberg. Goslar Imperial Palace and Mines of Rammelsberg are also within 12 mi (20 km). 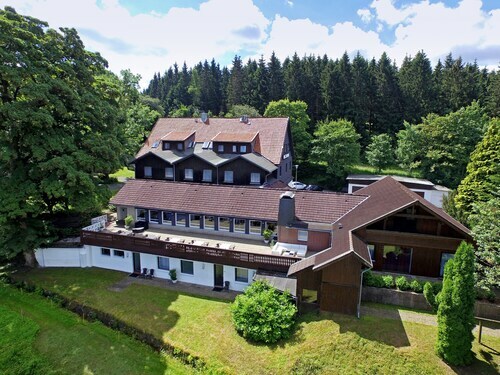 This family-friendly Goslar property is located in the mountains, 0.3 mi (0.4 km) from Gustav Adolf Stave Church, and within 9 mi (15 km) of Goslar Imperial Palace and Goslarer Rathaus. Marktkirche St. Cosmas und Damian and Museum und Besucherbergwerk Rammelsberg are also within 12 mi (20 km). Located in Goslar Rural District, this apartment building is 0.6 mi (1 km) from Gustav Adolf Stave Church and within 12 mi (20 km) of Goslar Imperial Palace and Goslarer Rathaus. Mines of Rammelsberg and Oker Dam are also within 12 mi (20 km). Located in Goslar Rural District, this vacation home is 0.6 mi (1 km) from Gustav Adolf Stave Church and within 12 mi (20 km) of Goslar Imperial Palace and Goslarer Rathaus. Mines of Rammelsberg and Oker Dam are also within 12 mi (20 km). 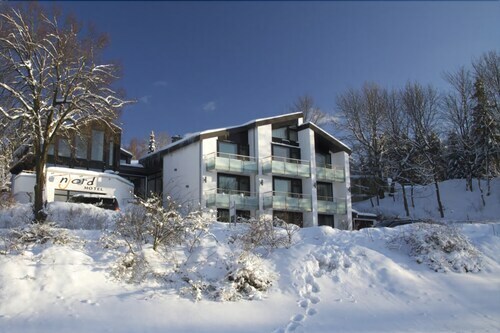 Located near the slopes, this Goslar Rural District hotel is on a lake, 0.9 mi (1.5 km) from Gustav Adolf Stave Church and close to winter activities such as cross-country skiing and snowshoeing. Goslarer Rathaus and Goslar Imperial Palace are also within 12 mi (20 km). Located in Goslar Rural District, this property is 0.6 mi (1 km) from Gustav Adolf Stave Church and within 12 mi (20 km) of Goslar Imperial Palace and Goslarer Rathaus. Mines of Rammelsberg and Oker Dam are also within 12 mi (20 km). Enjoy a spiritual experience at Stabkirche Hahnenklee, or just find out the riveting history and meaning behind this popular attraction. You'll be able to experience it when you travel to Hahnenklee, 130 miles (209 kilometers) from the state capital, Schwerin. If you are looking to be near Stabkirche Hahnenklee, book your room at one of 5 possible accommdations that are located within 2 miles (3 kilometers) of the site. The Hotel Njord, the Hotel Bastei and the Hotel Villa OpdenSteinen are a few that are popular, and they're just 0.7 miles (1.1 kilometer), 0.9 miles (1.4 kilometers) and 0.9 miles (1.4 kilometers) away, respectively. Spend some nights at the Hostel Goslar, 6 miles (10 kilometers) away, and free up your vacation budget for trying out the delicious local cuisine. There's just a few hotels within easy commuting distance, so make sure you book before you arrive. If you are hunting for someplace indulgent, look up the Hotel Niedersaechsischer Hof, just 6 miles (10 kilometers) away. Exploring a new town can be trying. Why not take a breather at Haus Sonnenschein (Wiesenstraße 18, Goslar), 0.2 miles (0.3 kilometers) away? After an epic day of shredding the slopes, relax in the relaxing atmosphere of the Bocksbergseilbahn. Visit Mines of Rammelsberg, a historic mine where you can picture life long ago. If you're up for a little edification, go and check out what's being presented at Rammelsberg Museum & Besucherbergwerk. Make arrangements to see Rammelsberg Mine and Mining Museum, an inactive, historic mine where you can imagine what the area was like long ago. Oker Dam makes a good stop over for those who are interested in the different methods of water management. How Much is a Hotel Room in Gustav Adolf Stave Church? Hotels in Gustav Adolf Stave Church start at $90 per night. Prices and availability subject to change. Additional terms may apply.